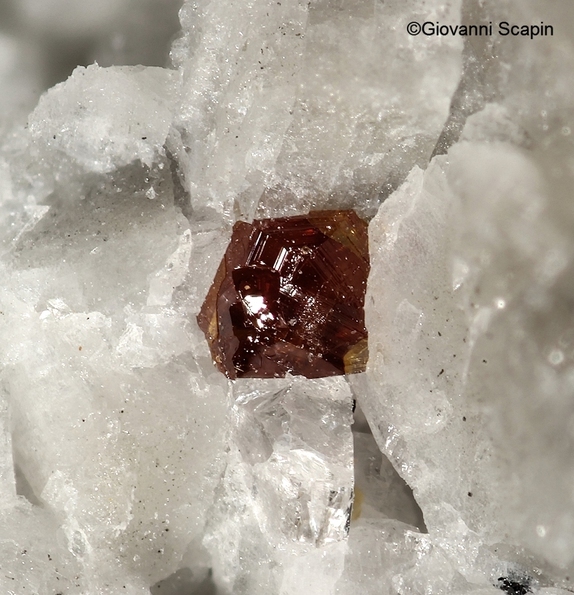 Fluornatropyrochlore: Mineral information, data and localities. For the chemical composition and relation to pyrochlore. Note: The original description (Yin et al., 2015) gives Boziguoer intrusion, Baicheng County, Akesu, Xinjiang Autonomous Region, China as type locality, but the CNMNC Newsletter No. 17 (October 2013) list gave Maoniuping rare earth deposit, Mianning County, Sichuan Province, China. 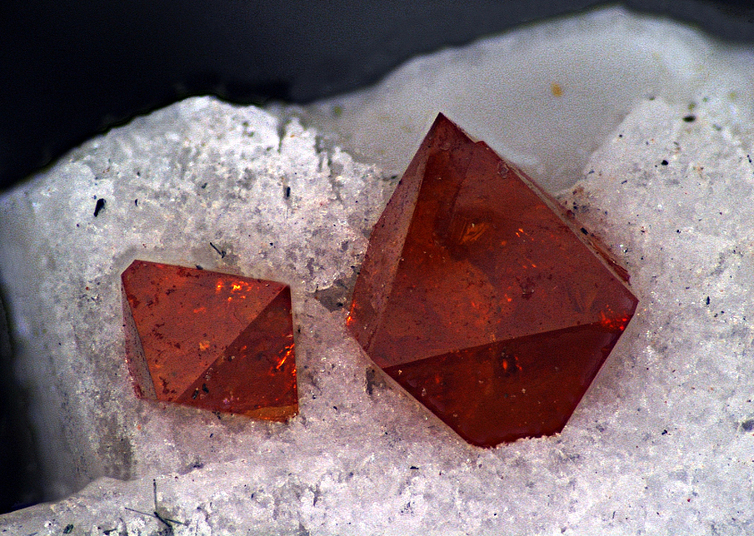 Anhedral crystals, rarely as subhedral grains, with a grain size of 0.02 to 0.25 mm. Holotype in the Geological Museum of China, Beijing,China, sample number M12183. Unnamed (HBU UK-3) 3 photos of Fluornatropyrochlore associated with Unnamed (HBU UK-3) on mindat.org. Gittinsite 2 photos of Fluornatropyrochlore associated with Gittinsite on mindat.org. Zircon 2 photos of Fluornatropyrochlore associated with Zircon on mindat.org. Elpidite 1 photo of Fluornatropyrochlore associated with Elpidite on mindat.org. Calcian Elpidite 1 photo of Fluornatropyrochlore associated with Calcian Elpidite on mindat.org. Bazirite 1 photo of Fluornatropyrochlore associated with Bazirite on mindat.org. Yin, J., Li, G., Yang, G., Xiong, M., Ge, X., and Pan Baoming (2013) Fluornatropyrochlore, IMA 2013-056. CNMNC Newsletter No. 17, October 2013, page 3003; Mineralogical Magazine: 77: 2997-3005. Jingwu, Y., Li, G., Guangming, Y., Ge, X., Xu, H., and Wang, J. 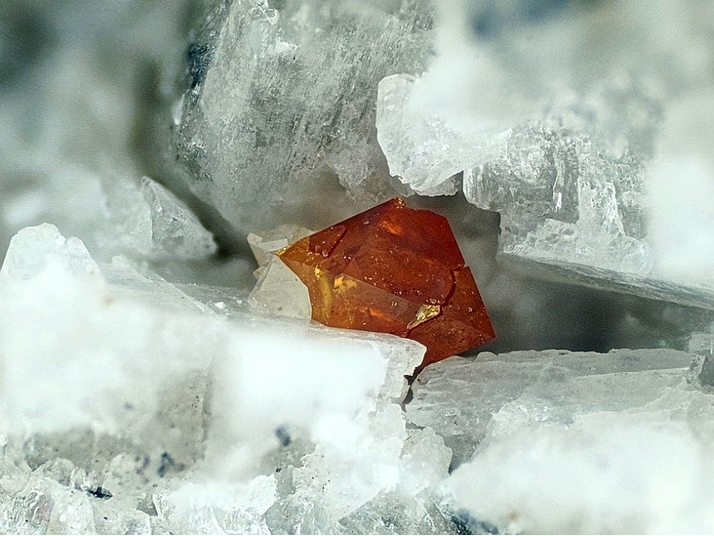 (2015) Fluornatropyrochlore, a new pyrochlore supergroup mineral from the Boziguoer rare earth element deposit, Baicheng County, Akesu, Xinjiang, China. Canadian Mineralogist: 53: 455-460. DUPUIS, C. & DAVID, E. (2013) Giant crystals of ilmenites and Baveno-twinned microclines from Girardville, Quebec, Canada. Rocks & Minerals 88, 420-433. Yin Jingwu, Li Guowu, Yang Guangming, Xiong Ming, Ge Xiangkun und Pan Baoming (2013) Fluornatropyrochlore, IMA 2013-056. CNMNC Newsletter No. 17, October 2013, page 3003; Mineralogical Magazine, 77, 2997 - 3005. Blaß, G. and Kruijen, F. (2015) Neuigkeiten aus der Vulkaneifel (II/2015). Mineralien-Welt, 26(5), 80-90.; Christophe Boutry Collection. Estrade, G. (2014): Le complexe cénozoïque alcalin d’Ambohimirahavavy à Madagascar: origine, évolution et minéralisations en métaux rares.- thèse de doctorat; Université de Toulouse, 256 pages + annexes. Pavel M. Kartashov analytical data; Atencio, D., Andrade, M.B., Christy, A.G., Gieré, R., Kartashov, P.M. (2010): The pyrochlore supergroup of minerals: nomenclature. Canadian Mineralogist, 48, 673-698.